Coelogyne (pronounced See-loj'in-ee) is epiphytic in the wild, growing on tree branches where it anchors itself with its roots. 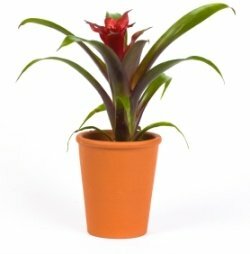 Epiphyte comes from the Greek words epi meaning upon and phyton meaning plant. All orchids in the coelogyne genus are epiphytic and have fat, round pseudobulbs, with long, narrow arching leaves emerging from the top. C. cristata flower stems can grow to 1 ft (30 cm) long, each carrying several flowers. And those pristine white flowers are stunning, with golden-yellow fuzzy markings on the lip and slightly ruffled petals. They're also intoxicatingly fragrant. With a cool winter rest (see below), you can expect an abundance of blooms in winter and early spring. Coelogyne cristata likes free-flowing air as in its native high-mountain habitat. Put it where it'll enjoy plenty of air circulation. Fans are fine, but keep it away from heat or AC vents. Shed some light. Put your orchid where it'll get plenty of light, but out of direct sun. If you don't have a spot near a window, grow lights work beautifully. Use 1 warm white tube and 1 cool white tube under a reflector. Place orchids about 8 inches (20 cm) beneath the light for 14-16 hours a day. It's also important to give them darkness at night. Orchids need a rest, too. To repot...or not. Fir bark medium breaks down after a couple years and needs replaced. The best time to repot your orchid is when new growth begins, shortly after blooming is over. Carefully tease out the old potting medium with your fingers, taking care not to damage its fine roots. Give it a rest. Coelogynes need a cool winter rest for 6 weeks to encourage flower buds. Give your orchid cooler temperatures (45-55°F/7-13°C) and water sparingly. Brown leaf tips can be caused by dry soil, dry air or tap water that contains fluoride, chlorine and salts that accumulate in the potting medium. This build up of soluble salts come from the chemicals in tap water and fertilizers. Use distilled or rainwater and increase humidity if the air is too dry. Raise your Coelogyne up on a pedestal plant stand as soon as you see the first buds appear. You want to show off those gorgeous pendulant flowers, don't you? Sticky leaves are normal for this genus. New unfurling leaves are often covered with a sticky sap. It's a good idea to wash off the sap at some point because it can bind the flower stems that emerge. Take it to the sink to rinse them off, using tepid water. Although coelogynes are not the easiest orchids to grow indoors, the sheer number of white-and-gold blooms make the prospect of cultivating them quite tempting. 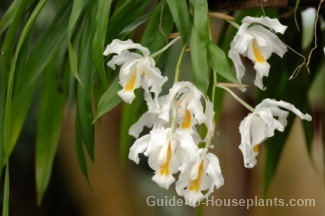 You'll find Coelogyne cristata orchids for sale in the winter and spring, when most are in bloom. Light: Bright indirect light year-round. Water: Water from the bottom to avoid getting pseudobulbs and leaves wet. Stand pot in tepid water for 30 minutes. Aim to keep the soil moist during the growing season. During the winter rest, water just enough to prevent the medium from drying out completely. 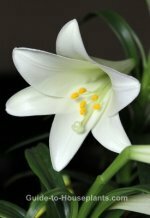 Coelogynes have water-storing pseudobulbs, making them more tolerant of dry soil than wet. Humidity: Moderate to high, preferably 50-70% relative humidity. If it drops below 50%, use a humidity tray or cool-mist humidifier. Grouping plants also helps to maintain the moisture in the air around them. Temperature: 60-65°F/16-18°C nights and 70-75°F/21-24°C days; requires a cool rest period to flower (see above). Fertilizer: Feed every 2 weeks while plant is actively growing and flowering. I recommend an organic orchid fertilizer because it won't burn roots. Don't fertilize during the winter rest period. Propagation: Division. The best time to divide is when you see a flush of new growth. Keep at least 6 pseudobulbs in a clump and pot it separately in orchid potting mix.